In the Vietnam era it sometimes seemed darkness prevailed, when achingly young men were ripped unwillingly from the bosoms of their families and from their lives in the world by the military draft lottery, sent to an unknown place, to a harsh new life of total transformation surrounded by death and destruction, often ending in death or destruction. Many were said to have found comfort in this Youngbloods’ song, melding the darkness of the outside with the darkness of the inside and turning it to something comforting. “Darkness, darkness,” sings Jesse, “hide my yearning for the things I cannot be.” I never went to the war in Vietnam or into the military, but as I dictate this, nearly 50 years later, I feel the tears threatening. I too was engaged in the war, in my own small, personal way, and I too went through changes. Transformation feels like loss, and that’s why in the tarot the black major cards feel so threatening to us, though they needn’t necessarily. “Darkness, darkness, be my blanket,” is Jesse’s plaint, “cover me with the endless night.” In the Death card we see everyone succumbing to total transformation, be they knowing Pope, pure Virgin, innocent Child, or worldly King. But we never ever are what we used to be: the adult is never the adolescent, the child is gone, the King is dead, long live the King. Sometimes, once we have begun to go through these changes, we become accustomed to the dark and we feel we are subservient to it. Dark becomes comfortable to us and we think we belong to it. The devil has us in his sway, or so we think. But keep looking. “Darkness, darkness, long and lonesome,” we hear, “ease the day that brings me pain.” For those who went to Vietnam, many were lucky enough to become Vets, and many of those were lucky enough to emerge from the Tower of War into the peaceful firmament of the Star, though not everyone seemed to make it all the way to The World. Or perhaps not the same world they left. Total transformation is life’s most difficult experience, and one does not come out of it at all the same person that one was when going in. This is often misunderstood by people waiting on the other side who have not changed, or who have changed differently, and their understanding may be key to bringing a person from the destruction of the Tower, to the Star to the Moon to the Sun to the World. “Keep my mind from constant turning,” Jesse pleads, “toward the things I cannot see now.” The wheel does constantly turn, though we can’t see it from the depths of darkness, and always right after the black cards comes the firmament, where if we have the strength and endure we can emerge into the ever brightening lights of Star, Moon and Sun, to float at last within the embrace of the whole World. The lights at the end of the tunnel. If only we can make it that far. 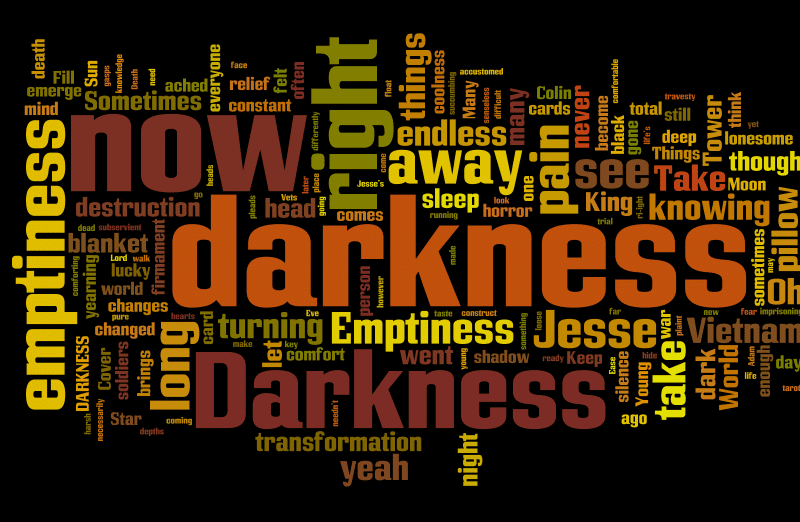 “Darkness, darkness be my pillow,” weeps Jesse, “take my head and let me sleep.” Through a long trial we beg for relief from thought itself and sometimes relief comes in the very form of sleep, our dark torment. Many soldiers of Vietnam so long ago, as with many soldiers of wars not so long ago and even today, have felt themselves in transformational darkness and it ached in their heads and hearts, and coming out of the darkness ached too. Sometimes, even in the world, they and we still ask for darkness to be our pillow, to comfort us from the memory of the emptiness of right now. Oh yeah. The emptiness of right. 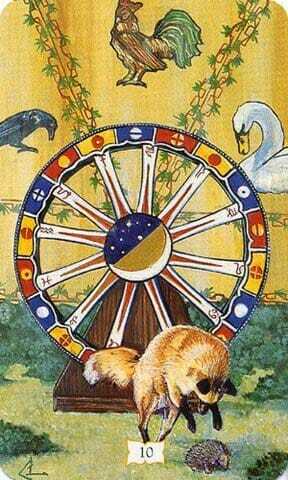 The Wheel of Fortune card is from the Golden Tarot of the Renaissance deck. 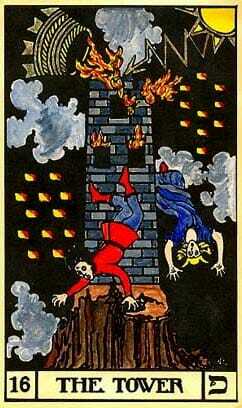 The first Death card is unattributed. Information welcome. 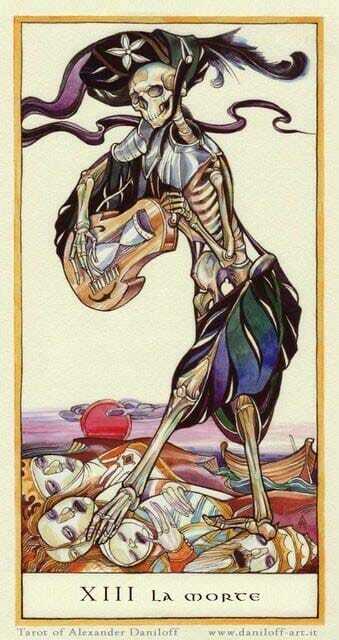 The second Death card is from the Tarot by Alexander Daniloff deck. 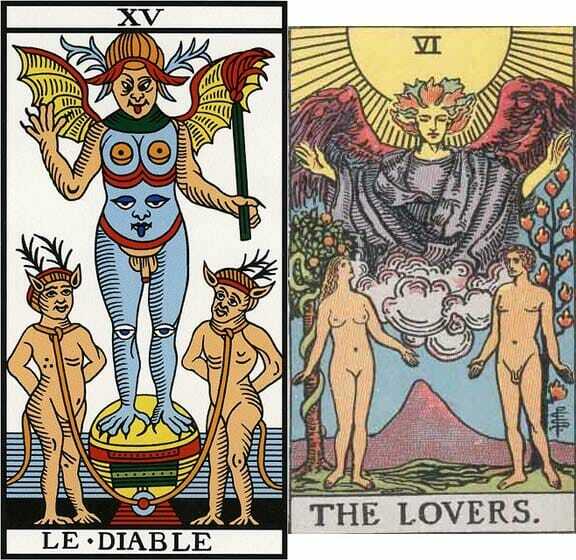 The Devil card is from the Tarot of Marseilles deck. The Tower card is from the B.O.T.A. 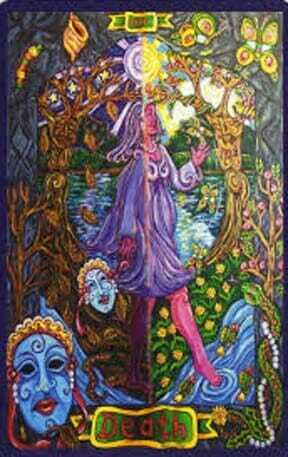 deck, colored by Sandra Mosley. 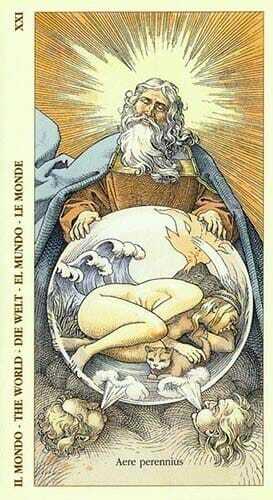 The World card is from the Tarot of Dürer deck. The remaining cards are from the Waite Smith deck.